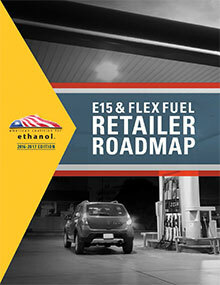 The Roadmap provides state-by-state information including vehicle and driver statistics, rules and regulations, financial incentives for retailers, and a general statistical breakdown of E15 and flex fuel availability and opportunity in that state. Click here to download an explanation of the sources of the information, and how we calculated some of the numbers. Finally, each state section also features an informal “back-of-the-napkin” calculation of the profits a station in that state might be able to gain if the owner added E15 and flex fuels and saw increases similar to those average E15 and flex fuel retailers have shared with us, or at a pace similar to those reported by the highest performing flex fuel retailers currently in the market. Neither example should be considered a “prediction.” Station owners and retailers understand their customer base and market conditions well enough to make their own assessment. These examples are included to remind marketers of other areas that can be affected by adding a new fuel. Most E15 and flex fuel retailers have stressed increased customer counts and inside sales as the most important factors in the financial success of adding higher ethanol blends. You’re thinking about adding or switching to a new fuel grade on your product slate, and you’ve considered premium and diesel, because those are the fuels all station owners consider. But today, the market is different, and you’re curious about what E15, E85, and other flex fuels could do for your business. Good move. Questions about flex fuels at your site? Email Ron Lamberty today. For more information about ethanol, visit the American Coailition for Ethanol. ©2019 American Coalition for Ethanol. ALL RIGHTS RESERVED. Why are leading C-Stores adding E15?